Summer Kitchen: a small building or shed that is usually adjacent to a house and is used as a kitchen in warm weather. Last night I decided it was time to make banana bread rather than send two over ripe bananas to the compost bin. I use a 1950 Wedgewood stove to cook and bake. This stove was purchased new by my Aunt Bo and Uncle Al. The only drawback is the oven is not well insulated and baking in the summer heats up the kitchen. This reminded me last night of the summer kitchen that was built at the same time as my home. In 1908, summers in Livermore were just as hot as they are today (record high is 115° F or 46° C). As I shared in a previous post, the original cast iron wood stove used coal for cooking. To keep the house cool during the summer, the meals were cooked on a small stove in the summer kitchen. When I took over stewardship of my old house, the summer kitchen was in very poor condition. Three out of the four walls were completely rotted at the bottom. What was left of the siding was all that was keeping it from collapsing. 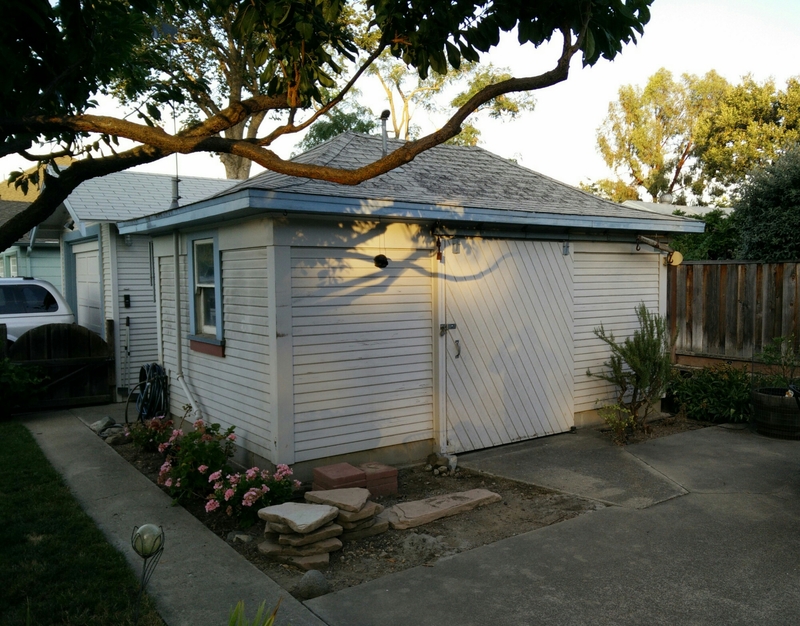 Most of the summer kitchens in Livermore were torn down many years ago due to dry rot and termite damage. As far as I know, mine is now the only one left in the old South side neighborhood (it also happens to be a stop on the walking history tour). Originally it was divided into a small kitchen area and a workshop. When I restored the summer kitchen I decided to replace the two small doors with the hanging sliding door since it is no longer used as a kitchen. Everything else about this historic structure is exactly the same minus the dry rot, termite damage, and knob & tube wiring. In its reconstruction, I used salvaged rough sawn two-by-fours from a neighbor’s 1920’s rafters which were removed to make way for a second floor addition. My old house is a labor of love and I am just the present caretaker. This old house has just about cured me of being a perfectionist. How fascinating! I’m so glad your summer kitchen is still intact. A good caretaker, you are.